Do you know what a Uromastyx is? The uromastyx is a lizard that can be found naturally in the Middle East and the northern half of Africa. They live and thrive in very arid regions where temperatures can reach over 120 degrees F. They make their homes in rocky outcropping and burrows dug into the ground. A uromastyx has a bulky body, a triangular head, and a tail that makes this reptile very distinct. The tail has large spikes from its base to the tip. The spiked tail looks more dangerous than it really is and most uromastyx tail spikes are not sharp. Depending on where you are from these reptiles can be called uromastyx, uros, dabb lizards, or spiny-tailed lizards. A uromastyx is a great lizard to have as a pet. They are friendly, docile, relatively easy to care for, and are fun and entertaining to watch. Uromastyx are fairly inexpensive reptiles and the initial setup of a habitat will actually exceed the cost of the reptile. 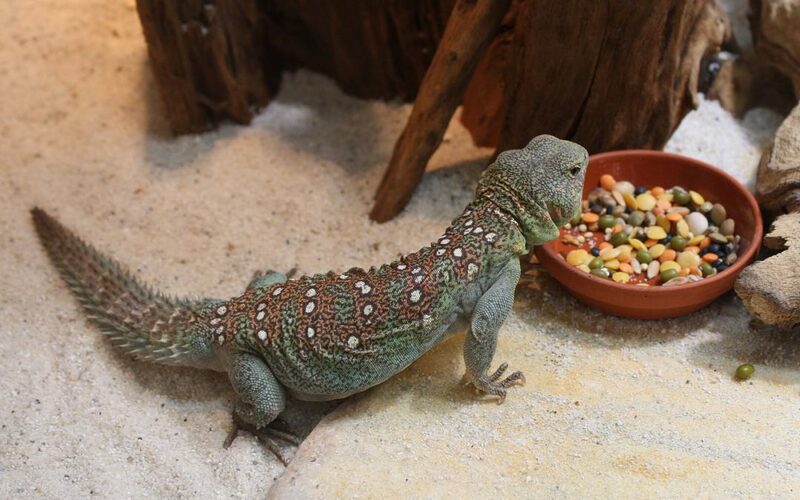 Supplying a uromastyx with food is quite easy since you can pick up his food from a grocery store. The most common uromastyx sold as pets is the uromastyx dispar maliensis, commonly known as the mali uromastyx. They are usually a brown color with yellow highlights on their backs. The males are often much more colorful than females. A male can have very bright yellow coloring as well as a black head and legs. A mali uromastyx can grow to be around 14 to 16 inches in length. Ornate, ocellated, and other species of uromastyx can also be found as pets. They can vary in size, coloring, and tail style compared to a mali uromastyx. Although different in appearance, they all have similar habitat and dietary requirements. No matter what type of uromastyx you get as a pet, they can be a wonderful and exciting addition to your home.